In attempting to write the history of the Riddle, the writer realizes that he is tackling a subject which is at once controversial and possibly of insufficient interest to the average automobile enthusiast or even the average reader of THE UPPER HUDSON VALLEY AUTOMOBILIST. However, there are three reasons for writing this story, the first of which is that although Riddle concentrated its efforts on both hearse and ambulance production, it also produced a limited number of passenger automobiles. These, to be sure, were cars primarily built for invalids use but nonetheless, they were passenger cars. Consequently, the name of Riddle will take on a new importance to any reader who is interested in the as yet unwritten history of those cars which are generally unlikely to be biographied. The second reason for writing this story owes its importance to the literature which was made available. The catalogue which is reproduced in this article is a prospectus devoted to the interests of funeral directors or ambulance operators, but the truth of the matter is that this is a most unusual piece of literature — one which is seldom if ever encountered in the collections of the many catalogue collectors and otherwise stands apart as a true deviation from the norm. In addition to this, we do not know of any fellow historian or club bulletin which has ever published a catalogue devoted exclusively to hearses and ambulances. If we may modestly take the credit for the initial presentation of such material, we rest on our laurels, however prickly they might be. Finally, we have been blessed with actual family ties concerning the Riddle family itself who have been most helpful in supplying us with this illustrative and certain historical material. This is the sort of opportunity to which THE UPPER HUDSON VALLEY AUTOMOBILIST dedicated itself many years ago- the writing of material which is available to us which many sister clubs have ignored for reasons to their best interests, and an opportunity which, if not taken seriously by some group, may never be available again to anyone. In that mad and altogether fascinating decade of the 1920's, better known these days as "the roaring twenties", the automobile business flourished in these United States as it never had before-- and in a way which it was never to do again. New makes of cars were introduced each year, some practical, some not so practical; body styles reflected the tone of the American buyer in his insistence or demand that HIS car might be a little different from that of his neighbor across the street. In an effort to cater to this demand, the established companies bent over backwards to offer as large a selection as possible with many different body styles available, a rainbow of colors and combinations of colors from which to choose and various gimmicks which might change the appearance of the stock model of this or that make to the point of true individualistic appearance. Wire or disc wheels added to those cars which came equipped with wooden artilleries changed many otherwise standard-appearing automobiles to less standard appearing automobiles. Cycle-fender treatments added to makes which came with standard type fenders and full running-boards changed others. But the point was, if the general appearance of cars couldn't be changed by some special wheel treatment, the addition of a trunk at the rear or an especially designed radiator, color combinations could be used to change the routine to the custom. Quite naturally, there were millions of automobile owners who didn't care about such matters and to whom automobiles were owned to provide transportation and nothing more. On the other hand, there were a great many owners to whom the difference in their cars reflected their own personality. Nearly every imaginable device was employed by automobile manufacturers or custom body shops to satisfy this ever-growing clientele. Open carriages of about 1880 (above) show the craftsmanship which was the watchword of the Merts & Riddle company. The lower of the two open models, described as an extension top brett, was trimmed inside with green cloth. 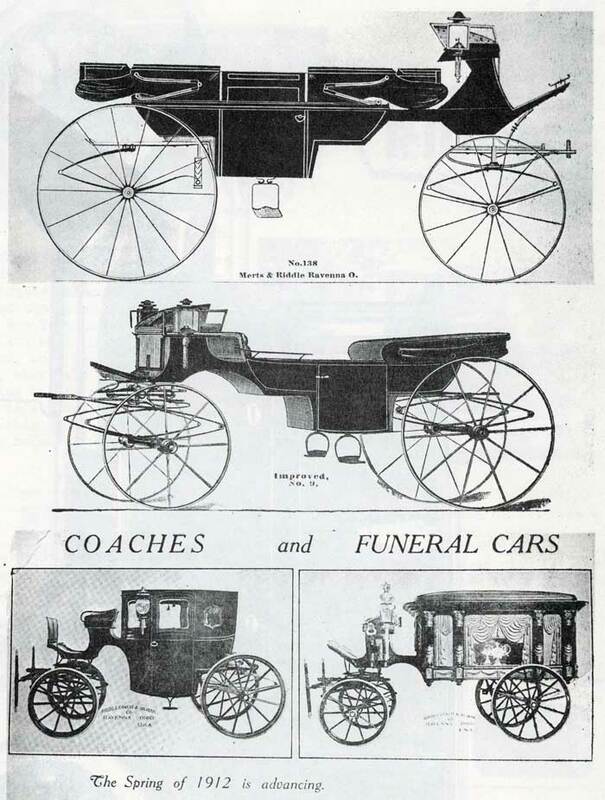 The catalogue also carried pictures of hearses, both for adults and children, as well as closed carriages. Lower pictures were taken from a riddle prospectus of a later date. 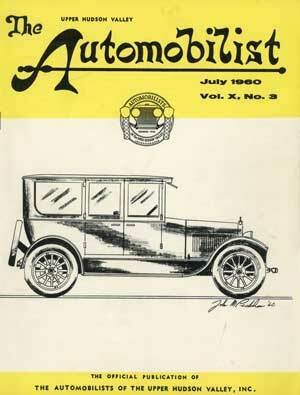 It will doubtless surprise many readers that these were 1912 models. At this time, many funeral directors were still not convinced that the motor car had come to stay. There was variety on the roads of the mid-twenties and there were makes aplenty, not only in current production but survivors of the many other companies which had ceased to exist one, two or three years earlier. It was a dullard indeed who, among auto enthusiasts, couldn't readily count sixty or seventy different makes of automobiles on any Sunday jaunt. But there was this other side to the penny and it wasn't a bright side, at least for automobile businessmen. Many companies were failing every year, their cars taking their places as orphans in the industry, their trade-in values depreciating heavily and even the average used car buyer finding himself reluctant to purchase one of these bargains, in many cases of which parts and service were becoming nil. In 1926, the grim reaper who watches the destiny of the motor car industry, gave the fine old name of Apperson the word. Also getting the ax during the year were Cleveland, Gray, Jewett, Lexington and others including the dashing ideal of the discriminating sportsmen-- there were some back then-- the ReVere. These cars had proven financially unsuccessful or, in the case of the ReVere, had just sort of outlived their usefulness, a reminder of the earlier days of the 1920's when variety was greater and demand was more consistent. It doesn't take a great deal of investigation to check out the actual year of a car's demise in most cases. But it was noted that another motor car company passed into oblivion in 1926. And it passed largely unlamented by those to whom the failure of Lexington or Apperson had seemed a tragedy. This company was the Riddle Motor Company of Ravenna, Ohio which, for ten years, had built more than creditable funeral cars, ambulances and a handful of sedans and limousines, especially designed for invalids in which wheel chairs could be placed into position in the rear section of the bodies. The reason for the apparent apathy on the part of the automotive public and those interested in the various makes of cars at the time was in no way the fault of the Riddle when it finally closed its doors. Generally speaking, few, save for funeral directors, ever really gave the make a thought. It was built primarily for funeral use and its brochures and catalogues found their way primarily only into the hands of undertakers. Riddle had an established clientele, advertised only by brochure, and otherwise seldom got its name into any of the automotive journals of the day. This is an interesting point when one stops to think of the many automobiles which produced only a handful of cars and yet appeared regularly on automobile rosters and specification charts. The few Riddle passenger cars built were thusly ignored for they were but a sideline of a larger industry. Consequently, the public knew little of them and interested persons who might have seen a Riddle sedan now and then must have wondered about the origin of the make. The first Riddle motor vehicles appeared about 1916, the last ones but a decade later. But Riddle coachwork had been highly renowned for many decades previously Riddle carriages having been offered in a complete selection of body types and in use not only throughout the United States but in many corners of the world. At least two presidents of the country were carried to their final resting places in Riddle funeral cars (William McKinley in September, 1901, and Warren G. Harding in August,1923). With the advent of the motor industry, this concern saw the ominous handwriting on the wall and added a line of bodies especially designed for motor driven chassis in the interests of modern thinking funeral directors. The first of these appeared on the White truck chassis. White operations were and are centered in Cleveland which is located only 38 miles northeast of Ravenna where the Riddle company was located. Meanwhile, the Riddle company still carried on its operations in the horse- drawn hearse division. The first bodies for motor driven hearses were made about 1912. As many funeral directors were slow to adopt motor hearses, generally speaking, and the Riddle company had been in the horse-drawn hearse business for so many years, it continued its horse-drawn funeral carriage designs with handcraft and carved-to-order designs which rivaled other companies in such a way that for sheer perfection and finish. Riddle took second place to no one. Meanwhile an increasing clientele continued to order the White-Riddle combination hearses and ambulances and between the first mountings to the last in Riddle's association with the White Motor Company, the bodies wars primarily if not exclusively coupled with the chassis of White, the big brother to the northeast. Riddle-bodied White hearse, built about 1915. Presumably, Riddle still supplied special bodies to order by White even after Riddle had started assembling complete hearses. RIDDLE BODIES in 1914 and 1915 were generally if not always mounted on White chassis. Hearse at right was built for the Frank E. Campbell firm of New York City. The location of the White Motor Company in Cleveland, only about 38 miles from Ravenna, where the Riddle bodies were being built, afforded a convenient relationship between the two. At this time, Riddle was still building horse-drawn hearses. 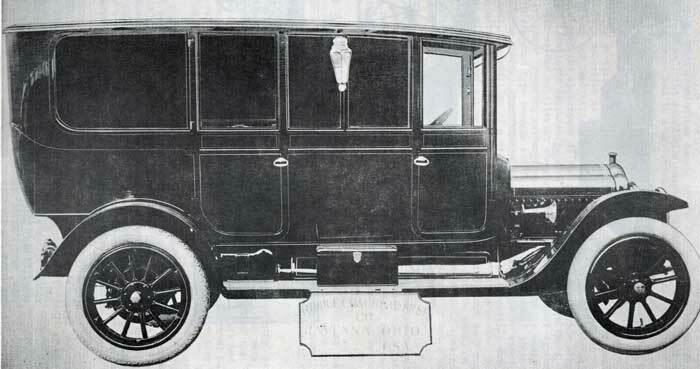 RIDDLE HEARSE of 1916 was among the first built after the company started assembling the complete vehicles. Rear view is shown below and side view lower left. There was considerable competition in the building of motor hearses and ambulances at the time, notwithstanding the considerable number of unconvinced undertakers who still felt that the horse-drawn carriage was far more suitable for the black line business and otherwise a prerequisite for the dignified funeral. Much of this motor hearse competition centered in Ohio and Illinois. In the decade with which we are concerned— 1916 through 1926-- Riddle was in stiff competition with Sayers & Scoville of Cincinnati, Meteor and Mort (an appropriate name for a hearse), both of Piqua, Ohio; Henney of Freeport, Illinois, and Rock Falls, a Velie subsidiary, of Streator, Illinois. There were others, to be sure, such as the highly-regarded and extremely posh Cunningham of Rochester, New York, and a number of others, manufactured by automobile and truck firms which manufactured funeral cars as a sideline. We prefer to use the term 'manufactured' rather than "built' in the majority of these cases for the result showed the intent, in many cases with painful reality. In the case of Riddle and other specialists in the field, great care and pride in workmanship was the watchword and the guardian of reputations which were never to be sullied by compromise with the commonplace. In the years between 1916 and 1920, funeral cars were the main bread-and-butter line of the Riddle company. The ambulances and invalid passenger cars were to make their appearance a bit later. Exception to this was the combination ambulance-hearse, a funeral car type which could be converted at instant notice to either use. This sort of car presented a problem to its manufacturer in the choice of his components as he had to have a vehicle which could travel very slowly under all sorts of conditions as a hearse and yet which could be used at high speed as an ambulance. These combination cars were popular for a short time before the two fields became more highly specialized to their own purposes. 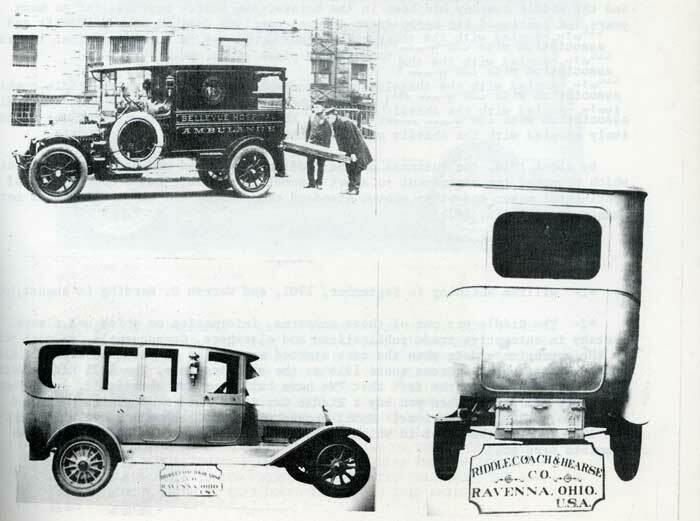 Five years progress in Riddle funeral cars may be seen in these two photographs, the first, a Riddle promotional photo of 1916 and the lower one, a combination hearse, ambulance and service car which appeared in the company's 1921 catalogue. The higher radiator and hood of the earlier car was retained through1920 when it was modified and lowered to some extent. In 1921, the radiator was lowered even more and squared off at the top, this design closely resembling the radiator used by Cunningham in the mid-1920's. Much of the hand carving on the bodies of the Riddles was executed by master wood-carvers from Switzerland. Riddle's pride in its product is reflected throughout the 1920 catalogue which is reproduced in full in this article. The guiding light of the business was Henry W. Riddle, a remarkable man and an outstanding gentleman in his community who was widely known in the Ravenna area as a promoter, builder, manufacturer and citizen. He was a lifelong Democrat, active in the Congregational church and a member of the Masons, Knights of Pythias, and the Elks. Henry Riddle was born in Allegheny City, Pennsylvania, now north side of Pittsburgh on February 8th 1838. Left motherless at an early age, he sold papers, ran errands and at one time carried the mail from Pittsburgh to Bethany, Virginia, as a boy. At the age of 13, he settled down to the serious business of life by apprenticing himself to the carriage builder's trade, serving three years with a John South in Allegheny City. He became a skilled workman and for five years after completing his apprenticeship, he remained with Mr. South as a journeyman. In 1856 he left Pittsburgh and went to New Orleans, stopping en, route at Memphis, Vicksburg and Natchez working in all these cities at his trade. Returning north, he stopped at St. Louis and Cincinnati, going from there to Dayton and later to Florence, Kentucky, also working in the carriage business. He varied this by the purchase of carriages in Pittsburgh which he sold about Florence, Covington and Cincinnati. In 1861, he located at Ravenna, Ohio, where in partnership with his brother-in-law, he bought the carriage plant of N. D. Clark which had been in business since 1831. As Merts & Riddle, he and his brother-in-law operated this business for thirty years. In 1891, Mr. Riddle became the sole owner of the business through the purchase of his partner's interest and soon afterward organized the Riddle Coach & Hearse Company of which he remained president until shortly before his death on December 16th 1920. The company later became the Riddle Manufacturing Company and sold carriages literally all over the world. Mr. Riddle, who was known to young and old in and about Ravenna, as "Uncle Henry", encountered great obstacles on the road to success, the Riddle plant being twice destroyed by fire, once in 1870 and again in June, 1903. Both times he rebuilt and restored his fortunes. His catalogues included a wide variety of hearses including children's hearses as well as those intended for the .funerals of adults. The reduction in the rate of child mortality through the years has eliminated the necessity for such a specialty line although such vehicles were far from uncommon shortly before the turn of the century. Other popular carriage styles included landaus, berlin coaches, coupes and rockaways. The Riddle carriages were particularly noted for their fine finish and meticulous detail so often lacking in the products of other firms of the day. Although the Riddle concern built both hearses and passenger carriages, the former had been a specialty for many years when, with the advent of the motor car, it was decided to concentrate its production on hearse bodies and, under a contract with the White Motor Company, Riddle took over the design and manufacture of most if not all of the bodies which White sold to funeral directors throughout the country. This brings up a moot point. Did White commission Riddle for the work and sell the finished product, settling with Riddle afterwards for the body in question-- or did Riddle purchase the White chassis outright for the mounting and sale of the body needed at the time? This is open to some question. Perhaps it worked both ways! About 1913, ambulances were added to the Riddle body line and for two or three years many were constructed for the White chassis. Meanwhile, although Riddle continued to produce horse-drawn vehicles, the demand for such was reaching a low ebb. When Riddle began to produce its hearses as a complete unit several types of carved hearses were made available as well as combination hearse-ambulance-bodied cars. Limousine-type funeral cars, in addition, could be had upon special order. These early Riddles were distinguished by a high radiator and hood similar in shape to that used by Pierce-Arrow and many other ears of the era. This hood and radiator was lowered somewhat in 1920. These 1920 Riddles were powered with the Continental 9-N engine which had a bore and stroke of 3.5" X 5.25" and developed approximately 50 brake horsepower. This same motor was used on several other cars of the period such as Vogue, Bour-Davis, Case "V-22", Comet, Ferris, Jordan "F" and Metropolitan. This engine was retained through late 1921 or early 1922. A major change in the Riddle design was effected in 1921 when the radiator was flattened to the extent that it resembled the Cunninghams of the mid-1920"s. The highly-polished nickel radiators on Riddles of the 1921-and-on period set the Riddle equipment off in such a fashion that its hearses, ambulances and the like commanded attention. The design must have been considered a good one by the company for it was retained to the very end of manufacturing operations. It is sheer speculation to attempt to determine when the first Riddle passenger cars were built, primarily because of the lack of information given in automotive trade papers of the time. The author's guess is that the original passenger models, built as seven-passenger sedans and designed for invalids (with special consideration given for the placement of wheel chairs in the rear) were delivered in 1919 or 1920. In any event we do know that the 1921 Riddle catalogue featured the seven passenger sedan which was built expressly for this purpose. From the right side, these cars did not differ from any other sedans or limousines of the time. But on the left hand side, it may be noted from the accompanying illustration and on the cover of this issue that the center pillar between the front and rear doors is missing. This allowed a large entrance space for wheel chairs or other invalid paraphernalia when both doors were ajar. Fact or fancy? No source has been located which can determine the exact date in which the first Riddle passenger cars, designed primarily for the use of invalids, were introduced. The writer of this article believes it may have been as early as 1920 and with the date in mind has worked up this composite of what he believes a riddle passenger car of the date would look like. No center pillar section would be found on the right-hand side of the car as access for wheel chairs had to be made from that side. 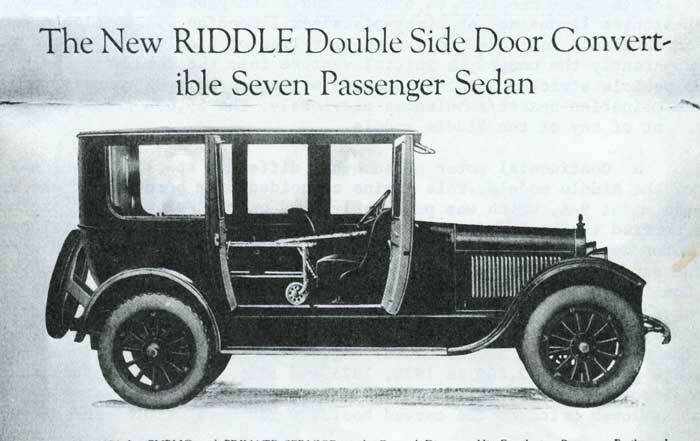 Fact- the 1921 riddle seven-passenger sedan, designed as an invalid car, is pictured as it appeared in the 1921 riddle catalogue. Note the absence of the center pillar on the right side car resembled the 1921 cadillac except for the curious fender apron treatment in front. Several well-known large automobiles offered such models but only with custom coachwork which made their purchase an impossibility for all except the well-to-do. Riddle offered a car embodying the same advantages for less than the price of the custom-built Packards and other machines of that type. The Riddle passenger automobiles were few and far between and possibly built only on special order. The general chassis design differed little from that of the hearses except that, if we are to judge from the one catalogue shot available, the radiators were painted and not nickeled in the style of the funeral cars. The 1921 and 1922 sedans and limousines strongly resembled Cadillacs of the era except for a curious fender apron treatment in the front (see lower picture on preceding page). It will also be noted that in the text immediately below this picture, the car is also recommended for "public and private service of the funeral director, his family or patrons." Without doubt, a few mid-western undertakers availed themselves of some of these cars for use by the bereaved families of the deceased for funeral procession use. Prices for the cars ran from $4,850 for the seven-passenger sedan to $5,500 for the nine-passenger limousine. An eight-passenger limousine was available for $4,850. In 1924, an ambulance was added to the regular line of Riddle cars priced at $5,850. This was apparently the company's initial venture into the ambulance field as far as building a vehicle strictly for this purpose was concerned. Of course, the company had built combination hearse/ambulances previously. The $5,850 price tag marked the highest amount of any of the Riddle models. Another innovation for 1923 and later Riddles was the substitution of disc wheels instead of the earlier artillery wooden spoked type. The practice of adopting the disc type had been underway by other hearse concerns and throughout the remaining years of Riddle's existence, the greater majority of its competitors such as Cunningham, Meteor, Mort and Henney vied with the Riddle's sales by offering similarly discwheeled funeral cars. Riddle was to retain this type, the Tuarc disc, through the end of its production. The invalid cars and ambulances of the 1920's, however, were exceptions for the Riddle and were uncommon, MoToR's January, 1923 show number, listed Riddle as having reported a total of 90 closed cars built during 1922, a high estimate to us. The company was listed at that time as having 100 employes with a C. G. Bentley as president and a hoped-for production of 200 closed vehicles for 1923. These figures must have included hearses for both years as well as the passenger cars. 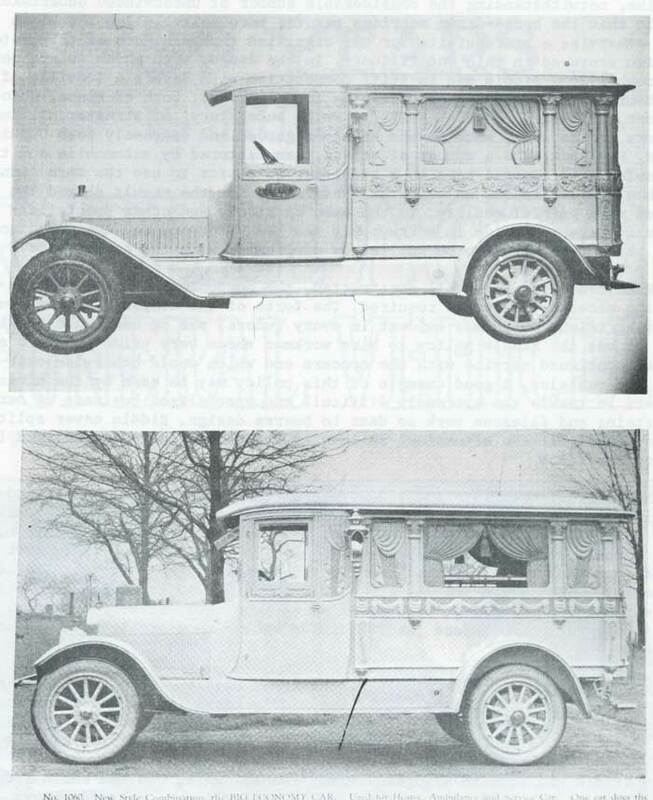 Riddle's combination hearse/ambulances which could be adapted to the dual purpose of conveying either the sick or the dead had enjoyed quite a vogue, but these conversion-type vehicles differed sharply from the more elegant but financially unsuccessful Riddle ambulances of 1924 and 1925, the last 'new' models to be built by the concern before production ceased altogether in 1926. H. Warner Riddle, who followed his father in the Riddle enterprise until the business ceased in 1926, still resides in Ravenna. But as for the product itself, few if any remain today. When one considers that hundreds were built and marketed all over the world, one stops briefly to reflect what must have become of all of them. 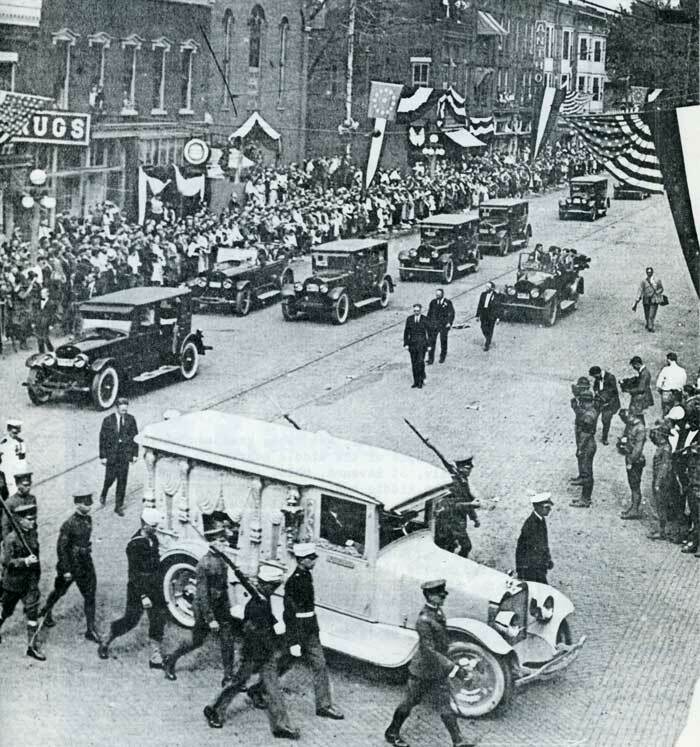 Funeral of President Warren G. Harding in August, 1923 at Marion, Ohio, was under the direction of the H. Schaffner company which borrowed the 1923 riddle hearse shown above as their own funeral car had not been completed at the time. Note open door on Lincoln sedan immediately following the hearse. 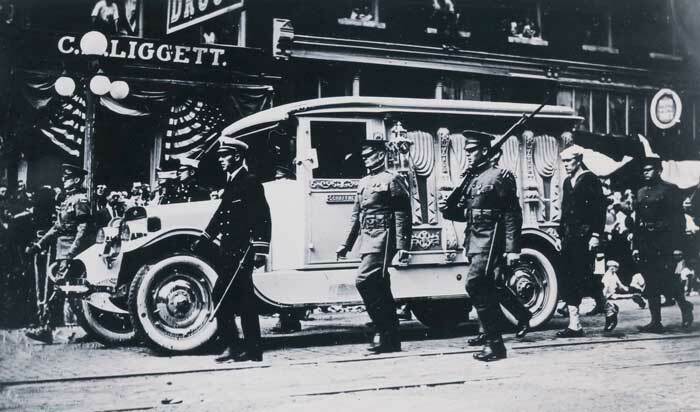 The 1923 Riddle hearse used for the funeral of Warren Harding. 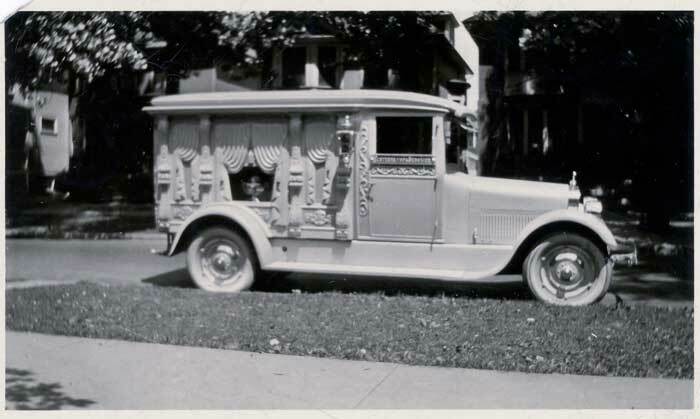 This funeral car was loaned to the funeral directors in Marion, Ohio, the Schaffner Company, by the Riddle Company and later delivered to Mungovan & Sons Co., of Fort Wayne, Indiana. 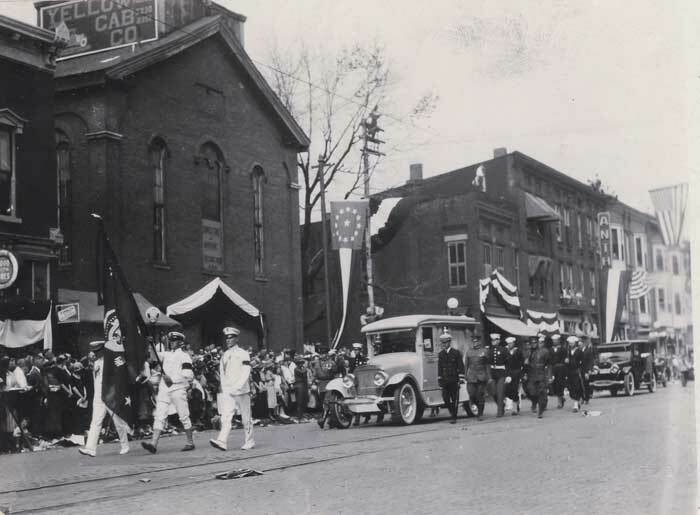 The hearse carrying the remains of the late chief executive is shown, flanked by military personnel, as it proceeded through the streets of Marion. Henry Riddle Merrill, of Loudonville, New York, grandson of the late Henry W. Riddle, for catalogues and photographs of the Riddle hearses. H. Warner Riddle and family, of Ravenna, Ohio, for catalogues, photographs and historical data relating to the Riddle business. Ralph T. Lewis of Marion, Ohio, for historical material and advice. W. S. Richardson of Ravenna, Ohio, for catalogues, photographs and historical data concerning the Riddle hearses and passenger automobiles. John A. Maxwell, Editor of THE MARION STAR, for his help. The MARION STAR was formerly published and edited by the late President Warren G. Harding. John Cipriano and the personnel of the Ravenna Chamber of Commerce. Wilfred Schaffner of the firm of H. Schaffner Company, Marion, Ohio. This firm was in charge of the funeral of the late President Harding. Russell T. Westbrook of Troy, New York, for his aid in reproducing photographic material. John M. Peckham of Troy, New York, for his cover drawing of the Riddle Sedan and his retouch work on the author's sketch of the fact or fancy 1920 Riddle invalid car. The White Motor Company of Cleveland, Ohio, for photographic material of the early Riddle-bodied White funeral cars and ambulances. Stanley E. Barton of Altamont, New York, for historical research. Archivist note – According to the newspaper clippings from family scrapbooks and other family papers available, there are no records of any presidents other than McKinley and Harding being buried from Riddle Hearses.